Facebook’s sharer.php is officially back. Not that most people had stopped using it anyway! Along with the new Share button, you can safely use the sharer.php syntax to create a link that shares a URL on one’s Facebook timeline. As there are still many articles/answers out there that have outdated answers to questions about this, I thought this was worth spreading the news. I’m glad that Facebook’s approach to this no longer has to bring about confusion. For a while (2012-2013? ), the official Facebook docs has a message that the share button was being deprecated. The Like button was to somehow take over. When this message appeared, it started to worry some web developers. Many continued to use the facebook.com/sharer/sharer.php formatted link (with the correct parameters). There didn’t seem to be a simple replacement, besides the Feed Dialog (API usage + an app ID), and what about the thousands of sites out there already using the Sharer syntax? This new Share Button works with a new version of our web-based Share Dialog. When using the sharer.php method of invoking the Share Dialog, this dialog will also display the new version without any changes required. The URL encoding is necessary because you are basically sending a URL within a URL, as a parameter in the query string. If you have certain special characters in your URL, then the browser may think it belongs to the facebook.com URL. Do you know how I can update the sharer.php piece of code to pick up the current URL and replace https%3A%2F%2Fparse.com in the code? You can use PHP to echo the current URL after the “u” parameter in the link, and it should be encoded to be used in a URL. Try this function and then pass the result through the php function urlencode before displaying it. So, we don’t have the option to determine a custom image via this sharer, as we could? Thank you so much, you have solved me a problem I had for three years! Thanks for the article! A question please: what’s the advantage of facebook.com/sharer/sharer.php over https://www.facebook.com/sharer.php, which is officially used on their website: https://developers.facebook.com/docs/plugins/share-button? https://www.facebook.com/sharer.php redirects to https://www.facebook.com/sharer/sharer.php, so they work the same. 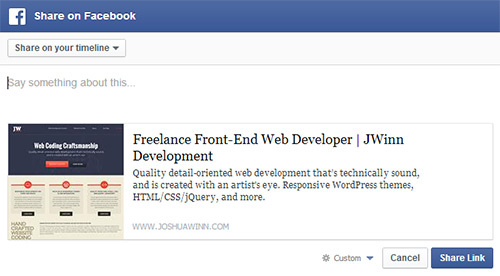 Do you know if its possible to use the share dialog to post directly to fan-page? It seems to only work for the current user’s timeline. I know its easy with the feed dialog but with it being deprecated and all that could pose a problem in the future. Unfortunately I need to register an app to use this endpoint. Yeah it looks like the page I was referencing has change dramatically. I wish FB would make up their mind about this. It should still work, but I don’t know what their plans are, and why it was removed from the FAQ. Thanks, you solved my Problem!